Looking for ways to care for your hardwood floors? Take a look at these 8 easy tips and keep your hardwood looking like the day you got it! You should sweep, dust, or vacuum your hardwood floors regularly to prevent accumulation of dirt, grit, or sand. These can act like sandpaper which could lead to scratches and/or dullness in your hardwood finish. It’s important that you use an appropriate cleaner designed for hardwood, not common household products such as soap and vinegar. 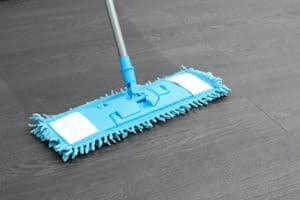 It’s not recommended to use water or oil-based detergents to clean your wood floors, because the pH value in some household items is high and these products may dull or damage the finish of your floors. The products that are specially developed for cleaning and protecting wood floors will do the job in the most careful and efficient way. Always remember to quickly wipe spills from the floor to protect your hardwood from the excess liquid, because excessive water will damage the hardwood causing them to swell and cup. The same theory applies to cleaning, never use a wet or damp mop on your wood floors. When moving appliances and heavy furniture, protect your floors by using felt pads to prevent scratches, never slide them across the floor. You may also place them on a reversed mat, the furniture will slide more smoothly over the floors. Remember that spiked heels can also damage your hardwood. Pet nails should be trimmed regularly to prevent scratches on the wood floors. It’s recommended to keep water bowls on a mat to prevent spills or humidity of surrounding floors. It is best to keep your home at a consistent temperature between 65-80 degrees Fahrenheit, and an average relative humidity between 35%-55%. Hardwood is a natural product, therefore, drastic fluctuation in temperature and humidity will cause your wood floors to expand, contract, cup, crack or even show gaps between boards. To minimize these changes, especially in the winter months and in the basement, it is recommended to use a humidifier or de-humidifier to level the environment. There are many places in the house that proactive mats come in very useful to protect your hardwood. At the exterior entrances: use them to prevent sand and dirt build-up on the floor. Near the kitchen sink: use them to prevent water, detergent or oil spills, and other kitchen mishaps. When we use radiant heat in the winter months, remember that engineered hardwood installed over these systems, surface temperatures should not exceed 85 Fahrenheit. Also, do not raise or lower temperature of the system by more than 5 Fahrenheit within a 24-hour period.